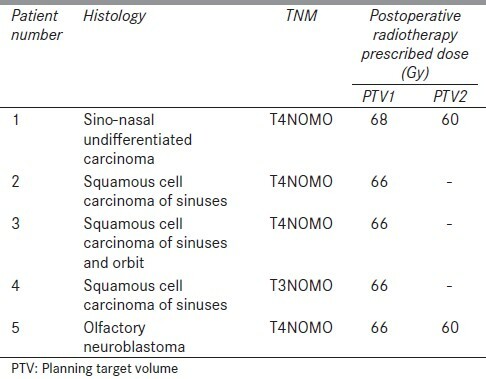 The aim of this study was to compare various dosimetric parameters of dynamic mlc intensity modulated radiotherapy (IMRT) plans with volumetric modulated arc therapy (VMAT) plans for sino-nasal cancers, which are rare and complex tumors to treat with radiotherapy. IMRT using five fields, coplanar in the sagittal plane and VMAT employing two coplanar arc plans were created for five patients. The plans were assessed by comparing Conformity Index and Sigma Index (dose homogeneity) in the Planning Target Volume (PTV) and through comparison of dose-volume characteristics to the following organs at risk (OARs): Spinal cord, brainstem, eye, ipsilateral and contralateral optic nerve and the volume of brain receiving 10% of the prescribed dose (V10%). The total monitor units required to deliver the plan were also compared. Conformity Index was found to be superior in VMAT plans for three patients and in IMRT plans for two patients. Dose homogeneity within the PTV was better with VMAT plans for all five cases. The mean difference in Sigma Index was 0.68%. 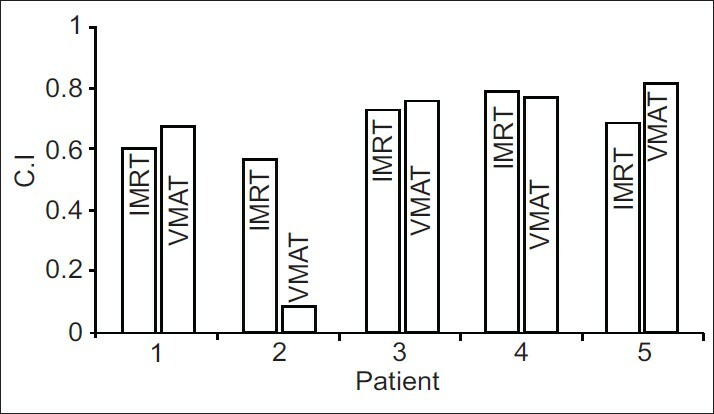 There was no significant difference in dose between IMRT and VMAT plans for any of the OARs assessed in these patients. The monitor units were significantly reduced in the VMAT plan in comparison to the IMRT plan for four out of five patients, with mean reduction of 66%. It was found in this study that for the treatment of sino-nasal cancer, VMAT produced minimal, and statistically insignificant improvement in dose homogeneity within the PTV when compared with IMRT. VMAT plans were delivered using significantly fewer monitor units. We conclude in this study that VMAT does not offer significant improvement of treatment for sino-nasal cancer over the existing IMRT techniques, but the findings may change with a larger sample of patients in this rare condition. The optimal treatment for sino-nasal cancer often involves initial surgery followed by adjuvant radiotherapy. Treatment planning of radiotherapy using conventional field delivery techniques presents particular challenges in this site. The proximity of the Planning Target Volume (PTV) to critical structures such as brainstem, optic nerve and eyes often requires compromise in dose prescribing to maintain morbidity within acceptable limits. This, in turn, leads to poor loco-regional control and survival. As a result, recent technical developments have led to growing interest in the potential of modern radiotherapy delivery techniques such as intensity modulated radiotherapy (IMRT) and volumetric modulated arc therapy (VMAT) to improve treatment. Sino-nasal cancer is relatively rare, and consequently there is little published work assessing the application of these techniques to this site. In this paper, we address the lack of studies in this rare condition by comparing dynamic mlc IMRT, henceforth referred to simply as "IMRT," with VMAT for sino-nasal cancer. We treated patients with sino-nasal cancers as follows: two patients with IMRT, two patients with conventional 3D conformal radiotherapy and one patient with VMAT. For those patients without a prospective IMRT or VMAT treatment plan, both were created retrospectively to enable a comparison of optimized IMRT and VMAT plans for all patients. Treatment plans were assessed to compare each technique in relation to PTV dose coverage and homogeneity, and in relation to each technique's ability to meet dose constraints on organs at risk (OARs). [Table 1] summarizes the histology and prescription information for the five patients. The Planning organ at Risk Volume (PRV) and PTV were produced with 3-5 mm margin from OAR and Clinical Target Volume(CTV), respectively. Three of the five patients had a single PTV defined, PTV1, to which a dose of 66 Gy was prescribed. The remaining two patients had two PTVs defined (PTV1 and PTV2), to which the prescribed doses were 68 Gy or 66 Gy, and 60 Gy, respectively. The concept of PTV2 is introduced following local practice and is used solely as a planning construct to limit the dose to frontal lobes. For simplicity, dose comparison results will be given for PTV1 only. 6 MV photons were used exclusively on all fields. All plans were optimized using the inverse treatment planning system Eclipse 8.6.15 (Varian Medical Systems). The IMRT and VMAT planning regimes shared a common set of final dose objectives, as shown in [Table 2]. During execution of the Varian Helios dose Optimizer (DVO) and Progressive Resolution Optimizer (PRO) algorithms, the actual dose constraints used were varied until an optimum solution was arrived at. 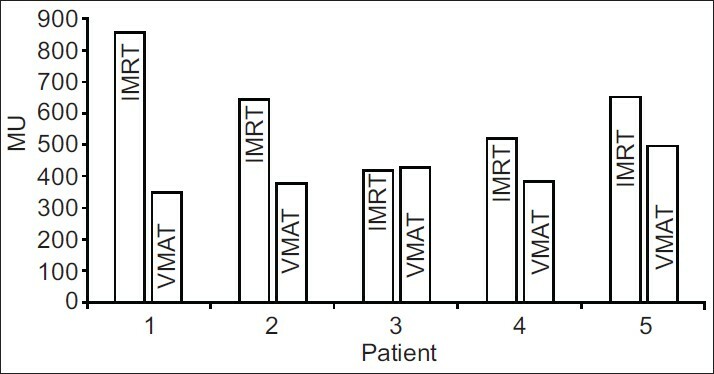 Thus, different constraints were used between patients and between IMRT and VMAT plans for each patient. All plans had optimal fluence calculated with the Varian Helios dose optimizer (DVO 8.2.23) and were implemented using that vendor's dynamic mlc (width 5 mm) technique. All patients were planned using five fields with gantry angles 0°, 330°, 300°, 270° and 30°, which is our standard practice, and we did not find significant improvement by using more gantry angle. The treatment table angle was set such that the fields were coplanar in the sagittal plane. This field arrangement minimizes dose to the eyes and brain and is illustrated in [Figure 1]a. A similar technique was described by. Arno J. Mundt,John C . Roeske and Claus F et al in the treatment of ethmoid tumors. , Dose calculations were performed using the Anisotropic Analytical Algorithm (AAA, version 8.6.14, Varian Medical Systems,USA). The Eclipse treatment planning system has the capability to model VMAT treatment using a planning and delivery solution known as RapidArc (Varian Medical Systems). Each arc is described by control points, of which there are 177 for a full 360 o rotation, generated by the optimization algorithm (PRO, version 8.6.14, Varian Medical Systems). All mlc leaf positions, gantry angle, gantry rotation speed and dose rate are varied as the treatment delivery progresses through each control point. RapidArc may be implemented with a single or multiple arcs. In this study, three patients were planned with two arc fields using gantry angle ranges of 270°-30° and 30°-270°, with respective collimator angles of 45° and 315°. The treatment table angle was set such that the arcs were formed in the sagittal plane [Figure 1]b. As with the IMRT plans, this arrangement minimizes dose to eyes and brain. Two patients with more extensive disease were planned with two larger angle sagittal arc fields (0°-180.1°, 180.1°-0°), with respective collimator angles of 45° and 315°. This field arrangement is illustrated in [Figure 1]c. Dose calculation was carried out using the AAA (version 8.6.14, Varian Medical Systems). Plans were deemed acceptable only if all dose constraint limits to the OARs were met. Quantitative comparison of the planned dose to the PTV was achieved by calculation of the following dose-volume parameters: Conformity Index (CI), mean dose to PTV, Sigma Index. where TV is the treated volume, i.e. the volume of PTV receiving 95% of the prescribed dose; V PTV is the volume of PTV; V 95% is the volume enclosed by the 95% isodose surface. Sigma Index = standard deviation of dose in the PTV. 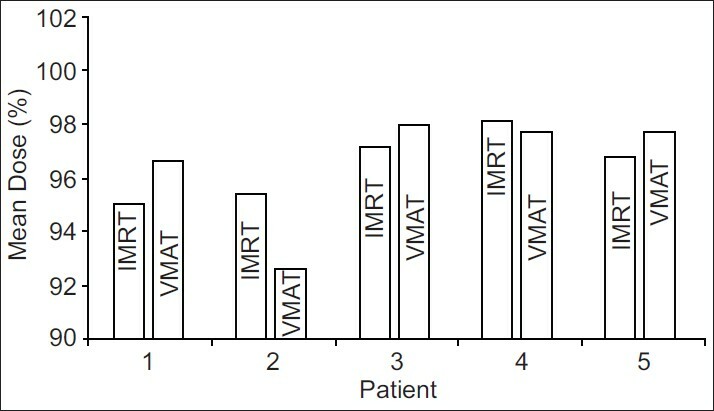 [Figure 1] and [Figure 2] show typical field arrangements & dose distributions for IMRT and VMAT plans. 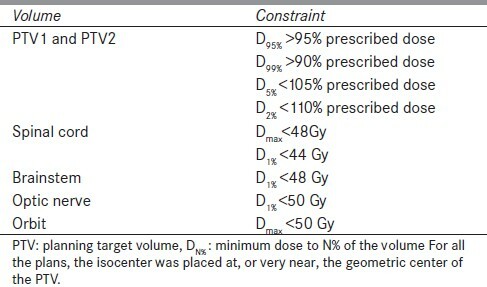 The ability of the two planning techniques to yield conformal, homogeneous dose distributions, at full prescription dose, to the PTV was assessed by calculation of the dose parameters shown in [Figure 3],[Figure 4],[Figure 5] for each patient. [Figure 3] shows CI, a measure of the degree of overlap between the high dose region and PTV1. A CI of 1.0 represents perfect conformality. The assessment of CI shows VMAT to be superior to IMRT in dose coverage of the PTV for three patients and to be inferior for two patients. For the three patients showing an improvement, the difference in CI was notable, involving an increase of 0.1 or more for VMAT. This equates to a 10% increase in PTV volume receiving at least 95% dose. For patient number 2, the VMAT plan had significantly poorer CI. This patient had extensive disease encroaching closely upon the optic nerve which resulted in abrupt changes in the PTV volume in this region. [Figure 4] shows the mean dose to PTV1 as a percentage of the prescribed dose. Strict application of the OAR dose constraints during optimization led to an inability for either the IMRT or VMAT techniques to deliver a mean dose of 100% to the PTV. Sigma Index is a measure of the degree of dose homogeneity within the PTV. 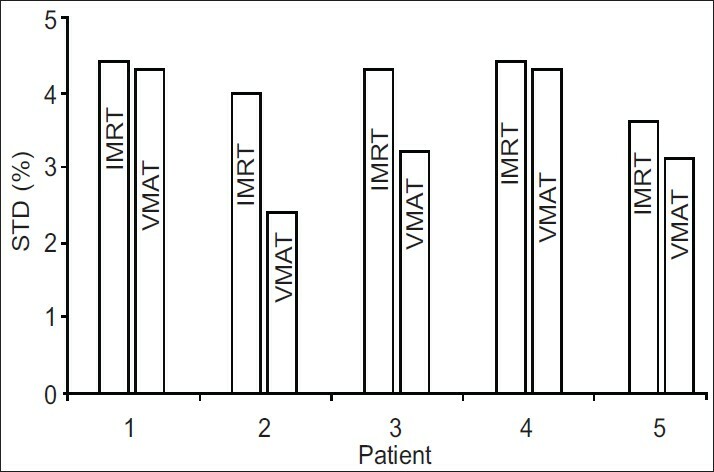 It is shown for each patient's PTV1 in [Figure 5]. Dose homogeneity within the PTV was assessed using the Sigma Index, calculated according to the formalism given by Yoon et al. Sigma Index is the standard deviation of dose throughout the PTV, on a voxel by voxel basis. This was felt to give a more representative assessment of homogeneity than conventional definitions based on discrete dose-volume parameters. Calculation of Sigma Index for this patient series demonstrates an improvement in dose homogeneity with VMAT. For all patients, Sigma Index was superior for VMAT compared with the optimal IMRT plan. The mean difference in Sigma Index was 0.68%. The number of monitor units (MUs) required to deliver a given prescribed dose affects both the practicality and the environmental impact of dynamic treatments. MUs for the IMRT and VMAT treatments are shown in [Figure 6]. In four out of the five patients studied here, the VMAT plan required significantly fewer MUs than the IMRT plan. The mean reduction in total plan monitor units was 66%. [Figure 7],[Figure 8],[Figure 9] illustrate dose-volume parameters for the OARs: Ipsilateral optic nerve, contralateral optic nerve, brainstem and spinal cord. For the optic nerves, the minimum dose received by the hottest 1% of the organ is reported (D 1% ). For brainstem and spinal cord, the maximum dose is reported. The volume of normal brain tissue receiving a low but significant dose is illustrated by calculation of the V 10% parameter (the volume of normal brain tissue receiving at least 10% dose). These data are shown in [Figure 10]. On comparing the IMRT and VMAT plans, we found no significant difference in dose to OARs, or to V 10% brain, the volume of brain receiving 10% or more of the prescribed dose. For patient number 2 and patient number 5, each planned with two larger angle sagittal arc fields, there is a clear, though insignificant, increase in V 10% compared with the IMRT plan. An examination of the spinal cord and brainstem doses reveals the suggestion of a trend toward these structures receiving higher dose with VMAT, but the significance of this is limited because all dose constraints were met. [Table 3] shows the Wilcoxon matched-pair signed rank test for dose-volume parameters, comparing IMRT and VMAT plans. This study compared VMAT with dynamic mlc IMRT in the treatment of sino-nasal cancer. The choice of a five-field IMRT technique with all fields coplanar in the sagittal plane follows local practice for this site. Antione Serre et al. reported recently that the difference between coplanar and non coplanar fields was very slight for this treatment site, with only a marginal improvement in homogeneity achieved with non-coplanar fields and no difference noted in CI. In the interest of simplicity, VMAT plans used in this study were also constrained to be coplanar in the sagittal plane. The work of Ke Sheng et al.,  who concluded that the coplanar geometry of helical tomotherapy resulted in equivalent or slightly superior plans than a non-coplanar approach for nasal cavity and paranasal sinus cancer, lends some credence to this strategy. Interestingly, patient number 2 had poorer CI in the VMAT plan. Increasing the VMAT plan MUs by 2-3% without re-optimizing would improve CI without breaching the dose constraints for all OARs except ipsilateral optic nerve for which the dose constraint is breached. The close proximity of the tumor to the optic nerve is the reason for accepting higher risk for optic nerve injury in patient number 2. 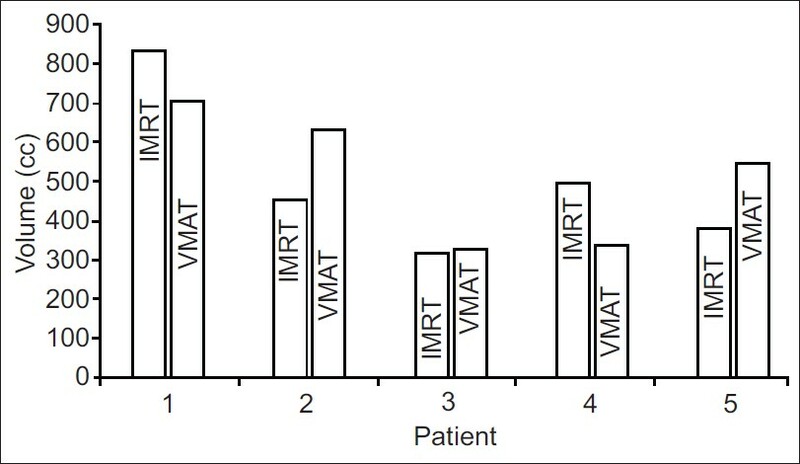 In a similar comparison of IMRT with VMAT for head and neck cancer, Bertelsen et al. found the target coverage in the IMRT and VMAT plans to be very similar. Our findings, by contrast, show differences in CI between VMAT and IMRT without establishing one technique to be superior over the other for this parameter. Some previous reports comparing IMRT and VMAT for head and neck cancer have reported that significant reductions in doses to OAR are achievable with VMAT. ,[ 12] These findings were not obtained in our study, which is in agreement with a recent study by Berteslen et al. It should be noted that the sino-nasal site considered here differs considerably in PTV size and shape, and in the relation of PTV to OARs from the sites considered in these other reports. The rarity of this tumor and paucity of published studies means there is no definitive planning technique with which to compare these findings. The study also shows that there was significant reduction in MUs for VMAT plans, which is in agreement with the previous reports on the introduction of VMAT as a replacement for IMRT. ,[ 13] We believe that the combination of reduced beam-on time with delivery in two arcs, rather than five fields, gives VMAT significant practical advantages over IMRT. This study has compared IMRT using five fields, coplanar in the sagittal plane, with VMAT employing either two coplanar or non-coplanar arcs, for the treatment of sino-nasal cancer. It was found that VMAT produces minimal, and statistically insignificant improvement in dose homogeneity within the PTV when compared with IMRT,. VMAT plans were delivered using significantly fewer MUs. We conclude in this study that VMAT does not offer significant improvement of treatment for sino-nasal cancer over existing IMRT techniques, but the findings may change with a larger sample of patients in this rare condition. 1. Mundt AJ, Roeske JC. Intensity Modulated Radiation Therapy-A Clinical Perspective. Ontario: BC Decker Inc Publishing; 2005. 2. Claus F, De Gersem W, De Wagter C, Van Severen R, Vanhoutte I, Duthoy W, et al. An implementation strategy for IMRT of ethmoid sinus cancer and bilateral sparing of the optic pathways. Int J Radiat Oncol Biol Phys 2001;51:318-31. 3. Van't Riet A, Mak AC, Moerland MA, Elders LH, van der Zee W. A conformation number to quantify the degree of conformality in brachytherapy and external beam irradiation: Application to the prostate. Int J Radiat Oncol Biol Phys 1997;37:731-6. 4. Feuvret L, Noël G, Mazeron JJ, Bey P. Conformity Index: A Review. Int J Radiat Oncol Biol Phys 2006;64:333-342. 5. Yoon M, Park SY, Shin D, Lee SB, Pyo HR, Kim DY, et al. A new homogeneity index based on statistical analysis of the dose-volume histogram. J Appl Clin Med Phys 2007;8:9-17. 6. Serre A, Idri K, Fenoglietto P, Ailleres N, Santoro L, Lemanski C, et al. Dosimetric comparison between coplanar and non-coplanar field radiotherapy for ethmoid sinus cancer. Radiat Oncol 2007;2:35. 7. Sheng K, Molloy JA, Larner JM, Read PW. A dosimetric comparison of non- coplannar IMRT versus Helical Tomotherapy for nasal cavity and paranasal sinus cancer. Radiother Oncol 2007;82:174-8. 8. Bertelsen A, Hansen CR, Johansen J, Brink C. Single Arc Volumetric Modulated Arc Therapy of Head and Neck Cancer. Radiother Oncol 2010;95:142-8. 9. Goitein M, Niemierko A. Intensity-modulated therapy and inhomogeneous dose to the tumor: A note of caution. Int J Radiat Oncol Biol Phys 1996;36:519-22. 10. Radiation Therapy Oncology Group. RTOG 0022: Phase I/II study of conformal and intensity modulated irradiation for oropharyngeal cancer. Eisbruch A, Chao KS, Garden AS, chairs. Philadelphia (PA): Radiation Therapy Oncology Group; 2001. Retrieved September 14, 2006, from http://rtog.org/members/protocols/h0022/h0022.pdf [Last accessed on 2001 Aug 31]. 11. Vanetti E, Clivio A, Nicolini G, Fogliata A, Ghosh-Laskar S, Agarwal JP, et al. Volumetric modulated arc radiotherapy for carcinomas of the oro-pharynx, hypo-pharynx and larynx: A treatment planning comparison with fixed field IMRT. Radiother Oncol 2009;92:111-7. 12. Rao M, Yang W, Chen F, Sheng K, Ye J, Mehta V, et al. Comparison of Elekta VMAT with helical tomotherapy and fixed field IMRT: Plan quality, delivery efficiency and accuracy. Med Phys 2010;37:1350-9. 13. Verbakel WF, Cuijpers JP, Hoffmans D, Bieker M, Slotman BJ, Senan S. Volumetric intensity modulated arc therapy versus conventional IMRT in head and neck cancer: A comparative planning and dosimetric study. Int J Radiat Oncol Biol Phys 2009;74:252-9.